An eventful week saw not just the NHS Expo, but a Health Tech Alliance meeting take place last week. The Alliance’s members heard from NHS England’s Dr Sam Roberts, Director of Life Sciences and Innovation and Senior Casemix Consultant at NHS Digital, Jill Cockrill, to discuss the uptake of innovation and the coding that underlies the reimbursement system, respectively. Dr Sam Roberts gave members a fascinating overview of the work of her team and the various innovation programmes she oversees. Sam was positive about the future of innovation, while acknowledging that there was still work to be done in developing solutions that address the lack of uptake on a nationwide level. Sam urged industry to reach out with solutions and examples of past successes, in order to better guide bodies such as NHS England in formulating national policies. Jill Cockrill who gave a thorough introduction on the work of NHS Digital’s National Casemix Office in transforming clinical information into a ‘national currency’ of various codes which are used to decide on reimbursement. The Casemix Office are constantly evaluating these codes and new codes are requested often. Jill was on hand to give members plenty of information on how industry can engage with her team to better understand how reimbursement is decided. Our meeting came a day before the 2018 NHS Expo in Manchester, which saw numerous announcements from the Department of Health and Social Care. While at the Expo, Secretary of State Matt Hancock announced plans to invest £200m in making a group of Global Digital Exemplars internationally recognised centres for technological and digital innovation for other services to follow, while also providing more details of the roll out of the new NHS app. 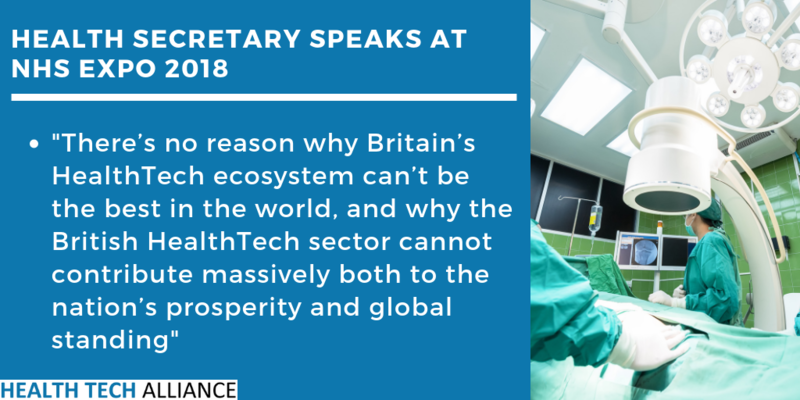 Health Tech Alliance Chair, Dame Barbara Hakin praised his commitment to investing in technologies that could ease pressures on clinicians, as noted in The Sun. Meanwhile, Health Minister Lord O’Shaughnessy announced a Code of Conduct for Data-driven Health and Care Technology. The code of conduct will set clear guidelines on how NHS patient data is protected and will allow the government to work with suppliers to guide the development of new technologies that are suitable for use in the NHS.